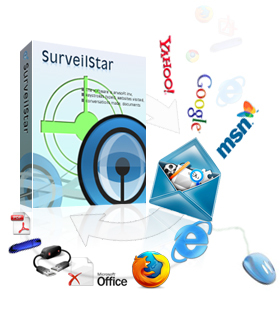 SurveilStar is the perfect PC control software for those looking for software to monitor their employee's or child’s computer and online activity. If you have deployed SurveilStar but it's not the latest version, please download upgrade package to upgrade. We will fix bugs and continuously add new features to this employee monitoring software. Check the version history below and you can see what cool features are added. Custom warning message of locking computer. Performance optimization on query speed of application log by class. Feature of searching computers in remote removable storage. Encrypted disk could not be used without removable storage policy. Netease Enterprise Mail could not be recorded. IM file transfer policy could not prohibit sending file through right-click menu. Some software could not be uninstalled through the console. Software installation and unloading control function. Printing QR code watermark function. Slow queries in Application Categories. Asset management cannot get some of antivirus software information. False alarm of asset changes alert. Website policy cannot control UC browser's feature called "hong xing chu qiang" which means cross the wall. Embed SQL Server 2008 to SurveilStar setup file. Application categories increased paging display, query and delete function. Increase the administrator password security and timeout lock. Assets have computer's system manufacturer and system model. Deployments supports Windows 8.1 and Windows 2012. Document operation logs supports Total Commander and Mame. Asset management does not support ESET and Windows Defender. Upload control cannot control IE11. IM file policy can control sending files by QQ. Client conflict with Skype 7.0. The administrator account can disable. When server's space is insufficient, console will alarm. The basic information have computer off-line days. The application policy prevents documents. Outlook2013 can not automatically receive POP3 mail. Upload control policy cannot control the FTP commandline. NetEase webmail simple version6.0 does not record. Fix the tpacket7 driver problem. Add MSI installation package format when creating a client installation tool. Optimize the agent installation steps to Windows 8. Client operating system upgrades can be identified as the same computer. Add screen historical inquiry function to logs of removable storage, e-mail and instant message. Fix issues that failed to record chat logs of QQ5.0, 5.1 and 5.2. Fix the problems that Win8.1 document control and operation of mobile storage control are not effective. Fix errors that Win2012 computer display as Win8 in the basic information. Fix the time limit is not effect problem when clear client policy temporary. Fix issues that failed to record 126 Mail. Fix some error of server event logs. Fix issues that application policy to 64-bit system is not in effect. Network access control system supports access control server taking unified management of access controller. Add printing and export function to the recorded history window screen in console. Documents can be directly distributed to client desktop through software distribution system. Display the account of domain structure. Fix the error that console statistics fail to export mht file. Fixed incorrect search results when searching in accordance with the number of days off of client computers. Fixed uncontrollable issues when the email subject is empty. Fixed issues that XP system does not support getting Internet browsing logs and statistical records of some browsers. Fixed errors when starting client system after hibernation, it would wrongly report network information will be added to delete. Fixed issues that 64 bit system fails to record text of QQ Enterprise Mail. Add Right Control menu to basic information about the console client list view. Add remember password function to the console password authentication dialog. Support web logs' recording of Baidu browser. Fix the Office document operating logs' missing recording problem. Fix issues that menu of 32-bit win 7 system will be slowed down after installing the agent. Fix crash errors when deleting Instant Message and Email records. Fix errors that it records only the first one among recipient, Cc and Bcc of Yahoo Mail. Fix issues that 64-bit win 7 system fails to support avant browser2012build189 Internet web browsing logs and statistics. Fix issues that 32-bit win 8 preview system fails to support IE10 (10.0.8103.0) Internet browsing logs and statistics. Support Skype's newest version (Skype 6.0). Modify the placement of some browsing records from "Document" Tab to "Browsing" Tab. Support multi-keywords search for Software Copyright Management. Support selecting default document type for Document Operation Logs' search. Select default policy type for Agent Configuration. Support instant messages' recording for enterprise QQ (400/800 version), 263EM4.0. Add support for Opera 10.50 and 10.51, Comet Browser 8.0, 2345Explorer. Add auto-alerts for agent communication error. Also support display the error agent. Fix the bug of IE9 recording. Fix Dell's fingerprint recognition bug. Fix UC8.3.4.22616, ICQ recording error. Enable to disallow wireless network use, bluetooth mouse use. Enable to set mobile operating storage logs. Improve the interfaces of Basic Policy and Device Control Policy. Support web logs' recording of 360 browser 5.1, Jinshan cheetah browser, the Swiss Film browser. Fix the QQ crash problem. Fix the invalid auto-encryption of 64-bit systems' mobile storage authorization problem. Minor update of last version 3.24.220.20. New client upgrade range management features. Fix minor bugs that fail to register and upgrade licenses. Fix Server Time Alert problem. Change back to the previous server icon. Fix 64-bit windows 7 compatibility problem. Support update version of mainstream browsers such as Firefox 10.0.2, IE9, Chrome 18.0, Safari 5.14, Opera 12 and others. Support update version of mainstream IM tools such as Google Talk 1.0.0.104, MSN 2011, Skype 5.5, QQ2012 and others. HTTP, FTP upload control policy. Control IM tools picture sending. Manage scope of client to upgrade. Import or clear all sorts of policies. Send notification messages with more than 256 characters. Choose type of selection when searching computer and user objects. Export lot number of screen history into WMV files. Record computer information when screenshot saved as a picture. Screen history viewer supports application multiple choice. Restriction of IP range log in to console. Email policy supports matching pattern of mails receiving. E-mail alerts support to alarm when client offline. Data recorded by days. Improve server's data processing ability. Easier backup, Easier organize and More secure! Deleted groups can be stored and reviewed. Import data from AD(Active Directory). Copyright management of asset information. Synchronous status of class library can be viewable. Strategies and library distributed to certain agent in priority. Generate a strategy deleting tool in Console. Administrator password can be reset. Alerts on agent exception and agent offline. Backup files exported in batches. Chatting contents exported in all policies. Logs on log in and log out of remote desktop connection. Logs enquiry by multiple keywords. Device control policy, traffic control policy, port control policy, and Email control policy for users. Import function added in setting windows of application policy and web policy. Application policy controlled by the directories of applications. Multiple line input of alerts in policies. Flash disk policy made in consistent with its description. Support to control IM files transferred larger than 4GB. Fix some recording error of mainstream browsers. Fix some recording error of IM tools, including Skype, MSN, ICQ7, QQ and others. Fix some mail recording error which subject is UPLOAD. Fix garbled issue when recording web mails some cases. Fix issue that Outlook cannot be recorded some cases. Back up when modifying network files via Office. Enable Office Outlook to use macro. Fix conflict between client and the F-Secure. Fix recording errors that identify 64bit XP operating system into Windows 2003. Get Office version when seeking assets information. Record logs when opening hyperlink files in Office. Record logs when moving files. Control documents in network mapping disk. Fix the issue that Ignore Mode is invalid in Document Policy. Fix the issue that cannot backup files when copying or moving. Fix the controlling error of mass storage drives on Win7. Fix issues that cannot record and control any non-USB interface connected to laptops. Fix the issues that protected U flash cannot be effective immediately. Enable to pull out encrypted disks. Fix issues that Network Neighborhood, Screen Snapshot, Internet Options are not available in Basic Policy. Fix issues that desktop cannot be displayed if all applications are forbidden. Fix URL opening error in CMD. Fix issues that Internet Explorer is caused to crash if media library was renamed. Fix issues that fail to restore basic policies. Fix issues that fail to disconnect connection to printers. Fix the error that sometimes program can't be installed under an administrator account. Fix the online registering problem. Fix the error that internet browsing can't be controlled. Fix the problem that displaying computer assets are slow. Fix the error that sometimes application policy can't be recognized normally. Add support to record browsing history of Google Chrome, AOL browser, 360safe browsers, MiniIE, Sougou browser and many other commonly used browsers. Fix the bug that sometimes file transferring by IM can't be controlled and part of IM messages can't be recorded. Fix the bug that Lotus Notes can't be recorded on some computers. Fix the bug that when using multiple removable disks, device policy may work incorrectly. Enhance network control support and removable device authorization for Vista and 2008.